The testbed will contain various energy sources, including a 3.5kW turbine generator, a 5kW PV solar panels, lithium-ion battery bank for energy storage, a plug-in hybrid car with bidirectional energy flow. The electrical system has two DC buses: a high-voltage DC bus and a low-voltage DC bus. The high-voltage bus is operated at ~300V, powering HVAC, simulated kitchen loads, and other major appliances. The low-voltage bus is chosen to be at 48V to coincide with the standard telecom voltage, powering computer loads and LED lighting. 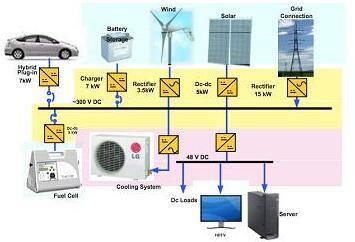 The whole system is connected to the utility grid via a bidirectional DC/AC converter.